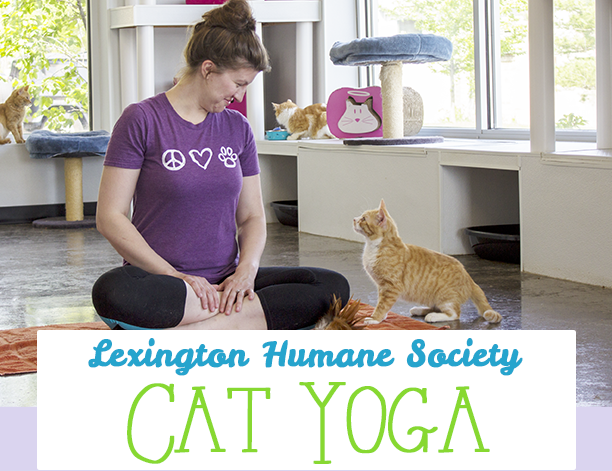 Your Lexington Humane Society is partnering with Mind Over Body Studio to bring you Cat Yoga in the LHS Nancy T. Barron II Habicattery! Each session is $15 and the 1-hour session will take place from 6-7pm. You must pre-register to participate in Cat Yoga. ​Thanks to our friends at Mind Over Body Studio, if you make an additional donation to the LHS animals ($20 or over) you will receive a FREE yoga class at Mind Over Body Studio! All donations, including the $15 registration fee, will benefit the over 5,000 animals we care for each year!